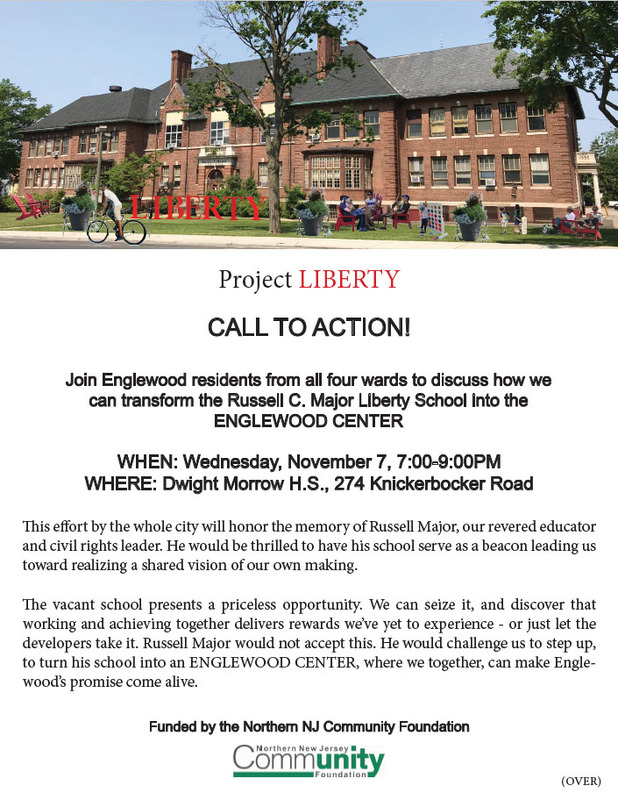 This effort by the whole city will honor the memory of Russell Major, our revered educator and civil rights leader. He would be thrilled to have his school serve as a beacon leading us toward realizing a shared vision of our own making. The vacant school presents a priceless opportunity. We can seize it, and discover that working and achieving together delivers rewards we’ve yet to experience - or just let the developers take it. Russell Major would not accept this. He would challenge us to step up, to turn his school into an ENGLEWOOD CENTER, where we together, can make Englewood’s promise come alive. Project LIBERTY was founded in early 2017 after a meeting convened by former Mayor Sandy Greenberg to discuss the future of the Liberty School. This group, open to all, has held meetings off and on since then, but never established itself as a formal organization. Over time, its leadership passed to the Northern NJ Community Foundation. That a decision affecting the whole city must be made by the whole city. This means in Englewood, that all four Wards must be at the table. That this effort should be guided by outside consultants with no connection to any Englewood individuals or interests. Accordingly, Project LIBERTY has organized an open and inclusive design process. It has asked two preeminent firms, introduced below, to assist us in our planning, making sure that every voice is heard so that what we create together truly reflects the concerns and desires of us all. While no decision about the school’s future has been made, there is general consensus that the historical building should be preserved, and that its highest and best use would be as a public, multi-purpose, arts, cultural, and educational center rather than as a private, single-purpose government, business, or apartment complex. Project LIBERTY has been consulting with two groups who are skilled at organizing public projects, The Project for Public Spaces, founded in 1975, is a nonprofit planning, design, and educational organization, that has helped communities and cities around the world improve how public spaces serve people. Using groundbreaking tools for community planning, PPS works with people to create and sustain public spaces that build stronger, more vital, and prosperous communities. Public Agenda works with municipalities to increase their effectiveness and efficiency. Costs can be lowered when residents, schools, and local governments work closely together. Such civic engagement builds mutual trust and understanding. With greater trust, policy deadlocks are broken and under-represented voices are amplified.